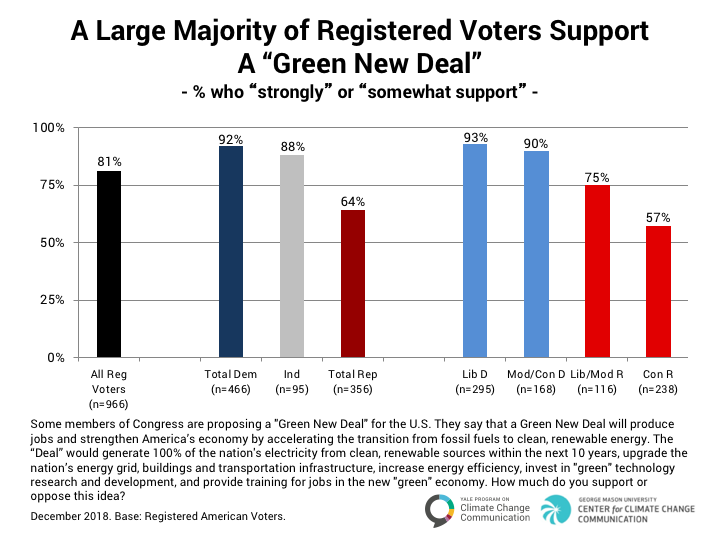 Eight in ten (81%) registered voters support the Green New Deal as described above, including large majorities of Democrats (92%) and Independents (88%). A majority of Republicans (64%), including three in four liberal/moderate Republicans (75%) and more than half of conservative Republicans (57%) also support the Green New Deal. 4.2. 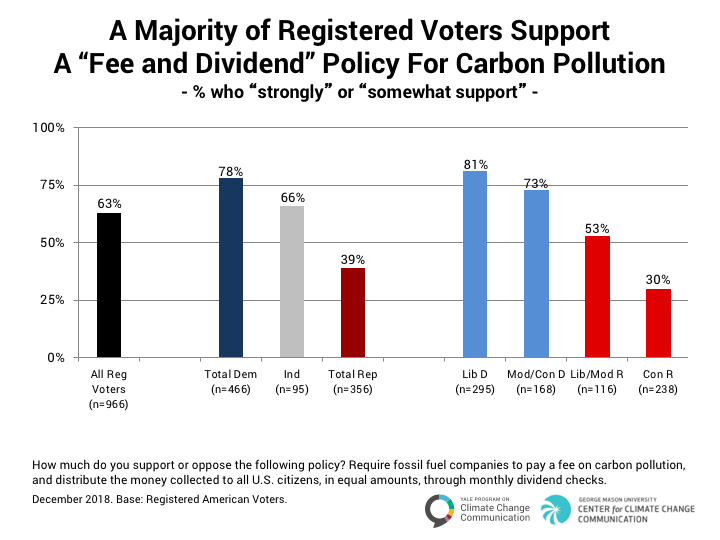 A majority of registered voters support a “Fee and Dividend” policy for carbon pollution. Another policy for mitigating global warming that is currently under consideration is a “Fee and Dividend” policyhttps://citizensclimatelobby.org/carbon-fee-and-dividend/ in which fossil fuel companies would pay a fee on the carbon pollution they produce, and all the money collected would be distributed to all U.S. citizens, in equal amounts, through monthly dividend checks. Six in ten (63%) registered voters support a Fee and Dividend plan, including majorities of Democrats (78%) and Independents (66%). About four in ten Republicans (39%) support the plan, including half of liberal/moderate Republicans (53%) but only three in ten conservative Republicans (30%). 4.3. 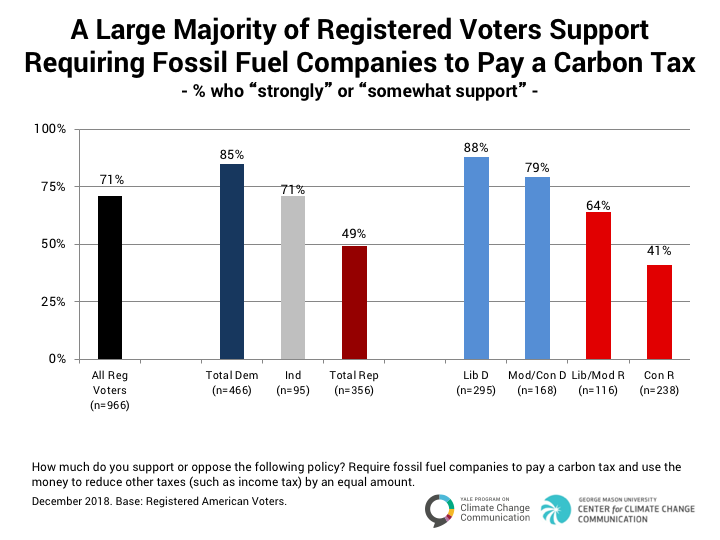 A large majority of registered voters support requiring fossil fuel companies to pay a carbon tax. Large majorities of Democrats (85%) and Independents (71%) support requiring fossil fuel companies to pay a carbon tax. About half of Republicans (49%), including a majority of liberal/moderate Republicans (64%), but only four in ten conservative Republicans (41%), also support such a tax. 4.4. 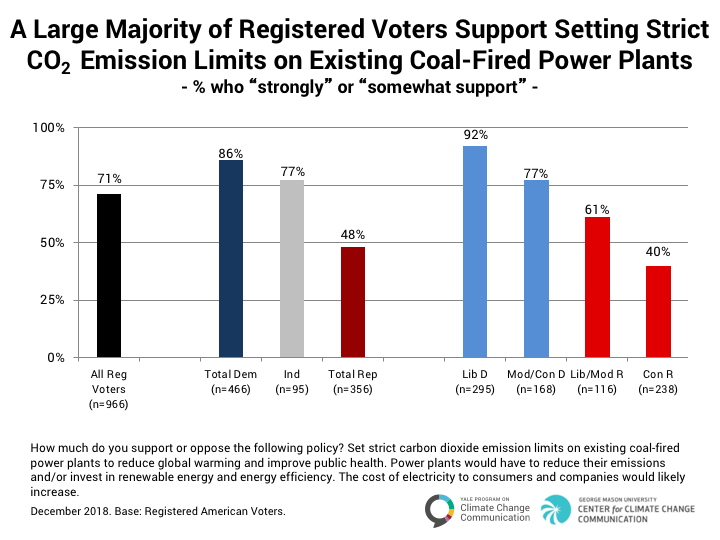 A large majority of registered voters support setting strict carbon dioxide emission limits on coal-fired power plants. About seven in ten registered voters (71%) support setting strict carbon dioxide emission limits on existing coal-fired power plants (a major component of the Environmental Protection Agency’s “Clean Power Plan”) to reduce global warming and improve public health, even if the cost of electricity to consumers and companies would likely increase. Large majorities of Democrats (86%) and Independents (77%) support setting strict limits on coal-fired power plants. About half of Republicans (48%), including a majority of liberal/moderate Republicans (61%), but only four in ten conservative Republicans (40%), also support such limits. 4.5. 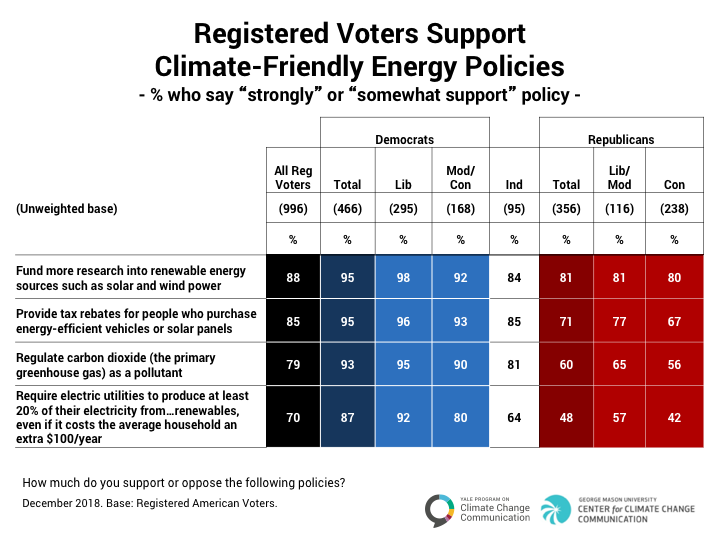 Registered voters support climate-friendly energy polices. Funding more research into renewable energy sources: 88% of registered voters, 95% of Democrats, 84% of Independents, and 81% of Republicans. Providing tax rebates to people who purchase energy-efficient vehicles or solar panels: 85% of registered voters, 95% of Democrats, 85% of Independents, and 71% of Republicans. Regulating carbon dioxide as a pollutant: 79% of registered voters, 93% of Democrats, 81% of Independents, and 60% of Republicans. Requiring electric utilities to produce at least 20% of their electricity from renewable energy sources, even if it costs the average household an extra $100 a year: 70% of registered voters, 87% of Democrats, 64% of Independents, but only about half (48%) of Republicans. Majorities of conservative Republicans support three of these policies: funding more research into renewable energy (80%); providing tax rebates to people who purchase energy-efficient vehicles or solar panels (67%); and regulating carbon dioxide as a pollutant (56%). 4.6. 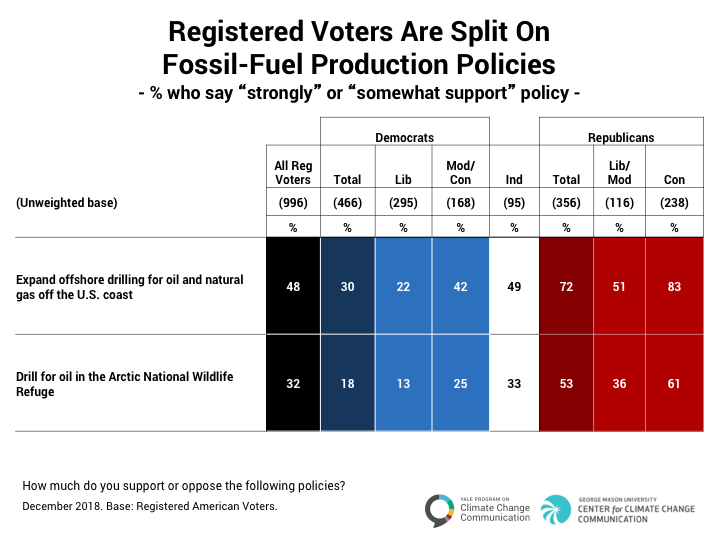 Registered voters are split on fossil-fuel production policies. About half of registered voters (48%) support expanding offshore drilling for oil and natural gas off the U.S. coast, including 72% of Republicans, 49% of Independents, and 30% of Democrats. By contrast, fewer registered voters (32%) support drilling for oil in Alaska’s Arctic National Wildlife Refuge (ANWR), while a large majority (68%) oppose it (see Data Tables). About six in ten conservative Republicans (61%) support this policy, but liberal/moderate Republicans (36%), Independents (33%), and Democrats (18%) are much less likely to support oil drilling in ANWR. Go back to 3. Who is Responsible for Action on Global Warming?